Beaulieu WW2 New Forest spies, Special Agents and lots more. Beaulieu WW2 New Forest spies or Special Agents. Beaulieu WW2 New Forest spies or Special Agents, as they are correctly named? Who were these agents? Why were they here? Where did they train? How did they train? What secret weapons did they have at their disposal? Lots of questions and fascinating answers too. 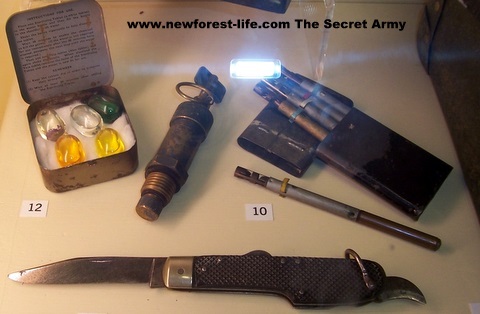 Beaulieu WW2 New Forest spies or Special Agents formed a vital part of our wartime defence strategy. When you find out what their work actually involved to be fully trained, ready for the "drop" into enemy territory, I'm sure you'll be amazed, as I was. Most didn't survive for long despite their brave efforts. Today we may be tempted to call these brave individuals spies. This isn't the correct term for their valiant efforts to infiltrate the enemy during World War Two on behalf of the Allies. Special Agents in the New Forest were based in Beaulieu and Bucklers Hard where they received their training. These villages contributed greatly to the successful outcome of the Second World War. The fact that well known Special Agents also trained in the New Forest during this time only came to light after World War 2 was won by the Allies. The woods on the estate were excellent for covert training. Houses on the estate were earmarked for very interesting use. The Special Operations Executive (SOE) trained on various parts of the estate. There was a German house, and also a French house and other relevant country designated set ups. In these houses special agents who were to be sent abroad on spying missions would be able to become familiar with the customs, habits, layout etc of foreign homes so that they would immediately assimilate into any foreign home they came upon. To me this is such an ingenious strategy. Whenever we stay with friends abroad part of our fun is seeing how their habits are different to ours. That's with our friends, imagine how glaring your mistakes would be if you were in enemy territory as the Beaulieu WW2 New Forest spies/special agents would have been! Terrifying! Beaulieu WW2 New Forest spies or special agents played a strategic part bacause once trained the airfield could then be dropped into enemy or occupied territory. Their training at Beaulieu should mean they would not be detected as foreigners - if their training had been successful. Lord Montagu is able to shed light on the Special Operations Executive (SOE) role, and New Forest Special Agents during WW2 in more detail. 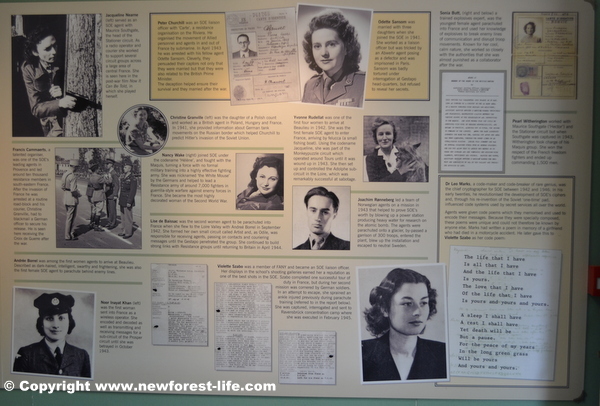 Beaulieu WW2 New Forest spies or Special Agents - what actually happened? Information only came to light after the end of the war when tongues were loosened at a celebration party on the Beaulieu Estate. Agents, who would become WW2 spies for the Allies, such as Odette and Violette Szabo went through the schools here to learn the necessary skills to become agents. There is a memorial to the SOE in the Abbey cloisters. The Beaulieu Aerodrome was used to fly these agents out to Europe in Lysander planes and also to fly people in who needed to leave Europe quickly but who were useful to the Allies. Agents also went on their spying missions by water on MTBs (Motor Torpedo Boats) from the Beaulieu river. Parts of the Mulberry Harbour were built on the river, which included a huge concrete floating dock which everyone thought would surely sink as it was so heavy! 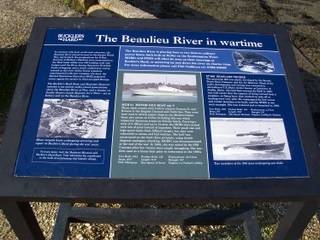 The Beaulieu river reverted to its previous use throughout earlier centuries and became a site for boat building again. All boats owned by the Montagu family had to be taken off the river and hidden in the garden - it was thought that Hitlers invasion was imminent at this time and so the boats needed to be hidden to prevent the Germans using them. The Navy had made the Master Builders Hotel their base for the area. Torpedo boats were being made at Bucklers Hard and Canadian landing craft known as Minka Barges. The villagers had a very unexpected bonus when the original date for the D Day Landings had to be delayed for 24 hours. The troops on the landing craft had been told to throw their original 48hr packs of food overboard as they would be given new ones to cover the delay period. The villagers had a great time over the next few weeks fishing packs of food out of the river and eating food that was in very short supply and heavily rationed! Nevil Shute was a frequent visitor to the area and it inspired his book Requiem for a Wren. As well as being a novelist he was also an aeronautical engineer and was also apparently involved in devising gadgets, which may have proved helpful to the war effort. There really is nothing new is there? Some of these gadgets would have impressed any inventor today. Even though parts may have been very hard to come by during WW2, he seemed to have no difficulty designing, acquiring and building useful tools to aid the wartime effort. Beaulieu WW2 New Forest spies or Special Agents - what about the locals? It sounds as though some fun was to be had despite it being WW2 - dances were often held a couple of times a week in the Beaulieu Abbey - but it did nothing for the floor as all those stomping army boots did quite a bit of damage! It was a World War Two wartime policy that should a damaged aircraft need, or was able, to stagger home once they were over the Channel they should only have a distance of 3 miles between airfields or aerodromes on which to land. This policy could be set up because a metal tracking system which could be used for landings could be laid resonably easily. They were called Summerfield Tracking and after WW2 were ripped up and some were used for fencing on the Beaulieu Park Farm. During World war Two it cost £5,000 to buy a Spitfire aircraft. Huge fund raising efforts were being constanlty made, which to me seems extraordinary as people were surely living on tight budgets? There was a Spitfire called New Forest but in his recollections in The New Forest at War book by John Leete, Lord Montagu feels sure it came to a sad end. After the D Day Landing a massive void was left to the people of the New Forest, but the river still found itself busy. Landing craft were still being made as well as the Minka barges. The Montagu family were allowed to put their boats back on the river as the risk of Hitler invading had passed, it was hopefully felt. 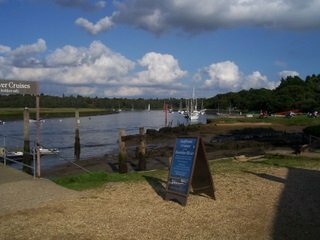 If you visit the New Forest and Beaulieu and Bucklers Hard, you may like to take a boat trip down the Beaulieu River. Think of the activities during WW2 which were going on and remember those World War two spies like Odette and others getting their training in the New Forest near to where you are standing today. Was anyone in your family part of the Special Agent Operation during WW2? The New Forest National Park Authority have received funding for a very exciting project called New Forest Remembers - Untold Stories of World War ll Why not share your memories? Contact me for the email address if you want. For example: put WW2 New Forest if you are looking to find further information on wartime New Forest and hit the Search button. 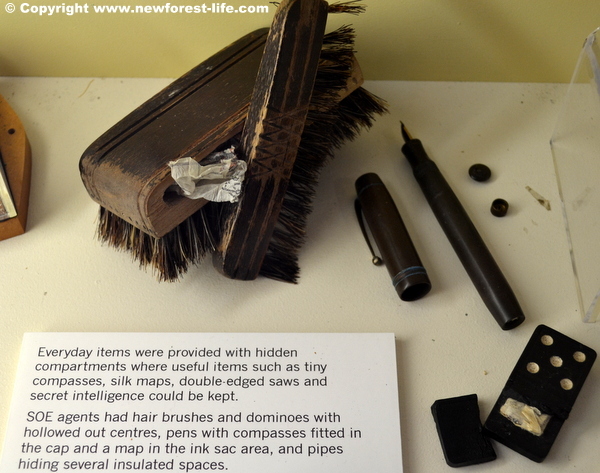 Beaulieu WW2 New Forest spies or Special Agents - well worth a visit? - yes! I hope you have enjoyed the fascinating role the Beaulieu WW2 New Forest spies and special agents played during World War Two. I've really enjoyed finding out about their intense and vital training. The SOE exhibition is thought provoking as well as being an insight into the very dangerous, but exciting, world of espionage. A visit to Beaulieu includes this exhibition and is well worth a day out, for all ages.